Did you have a good Mother's Day weekend? The older I get, the more I'm content to just spend the day with my two favourite people in the world and relax and enjoy a meal at home that I didn't cook. We did just that at the cottage. I've been dreaming for months about what I hoped this cottage would feel like. This weekend was ideal... time for relaxing in between unpacking boxes and putting rooms together. Time exploring the County. Together time and alone time. It was freeing to encourage Chloe to have her own alone time. Go outside and explore, we said. Go find sticks and look under rocks and poke around the cottages and chase the birds. We didn't have any TVs hooked up and no wifi yet so it was nice to see her occupy herself and make new friends and not get bored. It felt like a much simpler life at the cottage. That idea of simplicity has been on my mind a lot lately. A few weeks ago, I was invited by Muji Canada to visit their head office and talk with their team to hear about their philosophy. Are you familiar with Muji? Short for Mujirushi Ryohin, Muji means "no-brand quality goods". I first encountered Muji over a decade ago. In one of their stores in Singapore, I found a simple long latte spoon that I still use to this day. Muji values simplicity and moderation and embodies these in products that are pure, unadorned, streamlined and natural. Over the years, whenever I travelled I would check to see if my destination had a Muji store and I'm thrilled there are now two stores in Canada. Muji provided me their popular Beads Sofa to try out in one of their new cover colours. I gravitated towards Hickory, a pinstripe grey brown cover, and knew the sofa would look great in the cottage loft. Chloe quickly claimed it as her own. 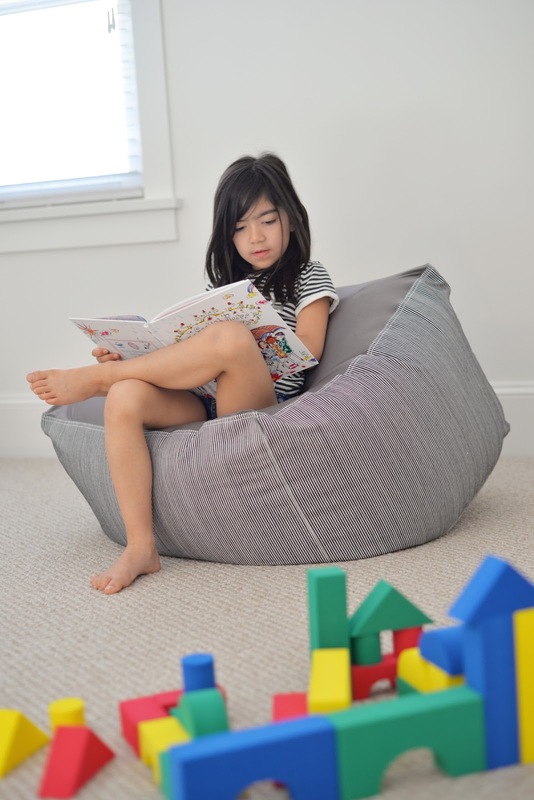 A girl content with a book in a bean bag chair. It's moments like these that I'll cherish as a mother. We're so distracted by gadgets and virtual things that the beauty and simplicity of the real world sometimes goes unnoticed. I'm glad I had this weekend to pause and breathe it in deeply. Disclosure: Muji Canada kindly provided this product for review but all opinions are my own. Could you use a little Muji-induced relaxation in your life? Starting May 13th, enjoy 15% off the Beads Sofa and Covers in store.